There are many ways to enjoy the garden in the Winter. I spend a lot of time stopping to appreciate the shapes and structures of dormant trees, see which plants have held onto their berries and seedpods, and of course marvel at bark, one of my favorite tree features at any time of year. Check out this post about my love of tree bark. Creating Winter containers is a fun challenge that makes you look at plant material in a new way and can encourage you to expand your plant palette. 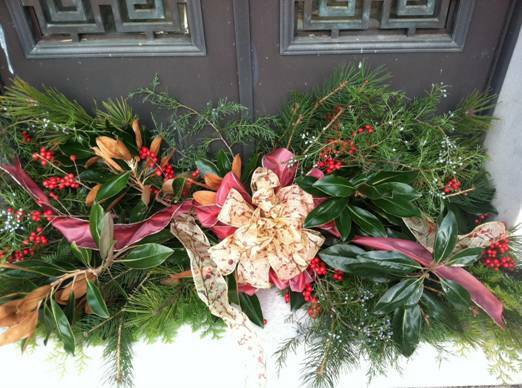 You can also create holiday containers and indoor displays with cut evergreens. Here are a few Winter containers and cut greens holiday displays that I have enjoyed this year from the United States Botanic Garden (USBG) and Lewis Ginter Botanical Garden. I just love the effect of white stone pots in the garden. And decorating them is always fun!